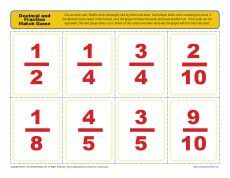 Here's a math match game for pairing decimals with their equivalent fraction. It makes learning fun! Use it as a practice for 4th grade Common Core Standards for Number & Operations - Fractions, or for other students as appropriate.